The idea for this post came for my absolute-favorite flavor of ice cream right now. It’s Atlantic Beach Pie from Jeni’s Splendid Ice Creams. They have 3 locations in Atlanta and many other around the country. I am absolutely obsessed with their scoop shops and can pretty much guarantee that I’ll get a double scoop anytime I’m near one. For the summer, they introduced Atlantic Beach Pie. Since I follow them on Instagram, I saw a picture they posted with the description of the flavor: sweet cream ice cream swirled with homemade lemon pudding and buttery, saltine cracker gravel. Hmm. Ok look, I normally don’t go for the fruit flavors, especially not lemon. I’m more of a coffee, caramel, or cookie dough ice cream kind of girl. But I had never heard of this kind of pie so I had to try it out. And let’s be real, saltine cracker gravel? Yes, please! How can I resist this sweet and salty flavor? Holy moly guys! This combination was HEAVENLY. This ice cream was one of the best balance of flavors I’ve ever had. The lemon was very subtle but still tart and the saltine gravel balanced out the sweetness of the ice cream base. AH. MAY. ZING. I’m drooling just thinking about it. I’ve been addicted ever since. I even buy it by the pint now so I can enjoy it at home. The worst part about being addicted to this flavor is that it will soon be discontinued since it’s just a summer flavor. So I needed to find a way to keep Atlantic Beach Pie in my life. But how? I thought: maybe I can try to make this ice cream at home? But there are so many parts to this ice cream that I was exhausted just thinking about all the steps: make saltine gravel, make lemon curd, make ice cream base. Phew! I just can’t handle it right now. Ok so maybe I can just make the pie? Yeah, that’s it: I’ll make the pie! I started researching the pie and I found out that it’s native to the North Carolina coast. There’s actually a cool reason why this pie because popular there. Back in the day, it was thought that if you ate dessert after eating seafood, you would get really sick. Insanity! The only exception was lemon desserts because you typically put lemon on seafood. So it must be okay to mix the two, right? And so a legend was born. And the pie came out just as amazing as the ice cream. I think it’ll be even better if I freeze it. Or maybe I could break it up and put it over ice cream?! Is that too crazy?! Never! 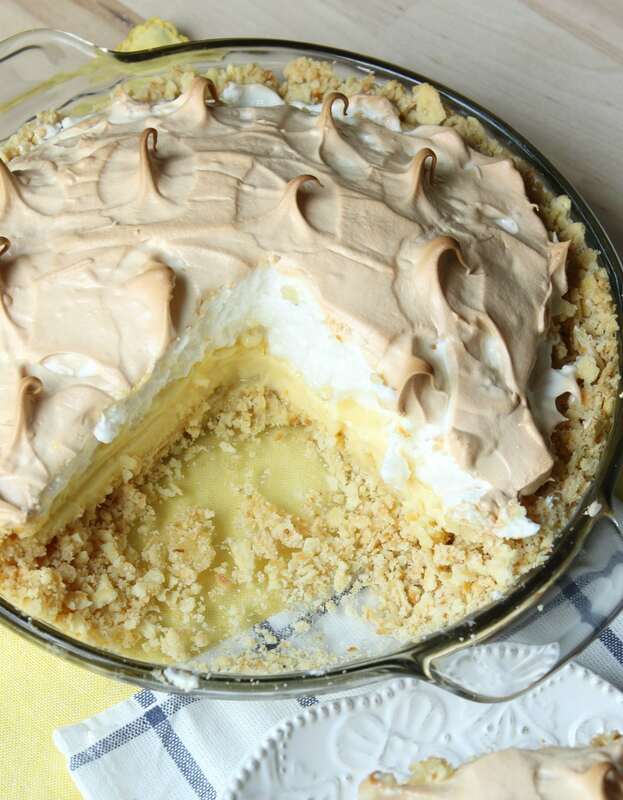 The original recipe has whipped cream on top, but I personally think meringue keeps better and looks better. I also prefer the airiness of the meringue. But feel free to used whipped cream if that’s what you want. You need to let the cooked pie set in the fridge for about 6 hours until it’s fully chilled before you can slice it. Consider this when planning out your baking time. Do not use a food processor to crush the saltine crackers. You don’t want them to turn to crumbs, but rather small little flakes. A little smaller than a pea. I used a rolling pin to smash them in a plastic bag. To make little peaks in your meringue, use the back of a spoon to slightly tap the meringue. 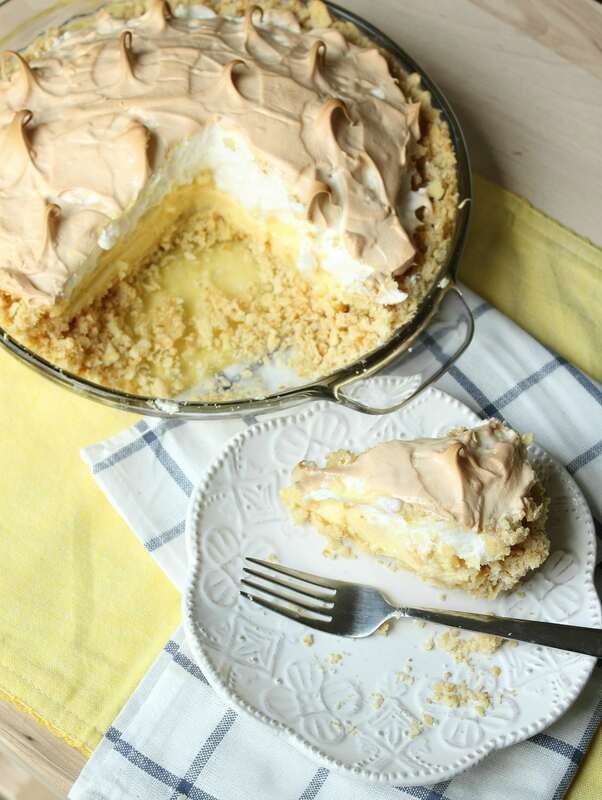 When you raise the spoon, you’ll notice that a small peak of meringue forms. Continue doing this all around the meringue. To get the meringue to brown evenly, rotate it around in the oven. Most ovens have hotter spots so moving the pie around will brown it evenly. 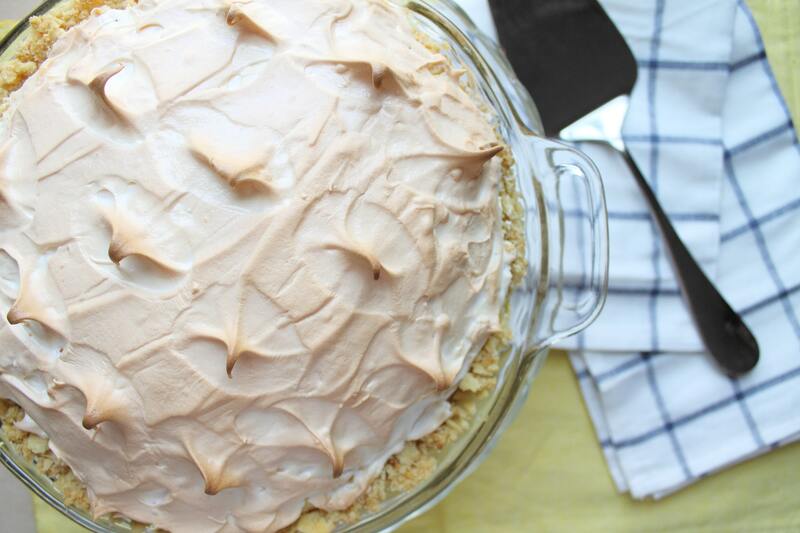 This pie won’t be as tart as lemon bars or a lemon meringue pie. It’s supposed to be a subtle lemon flavor. If you want more lemon, just add a few more tablespoons of lemon juice. Probably no more than 3 more. 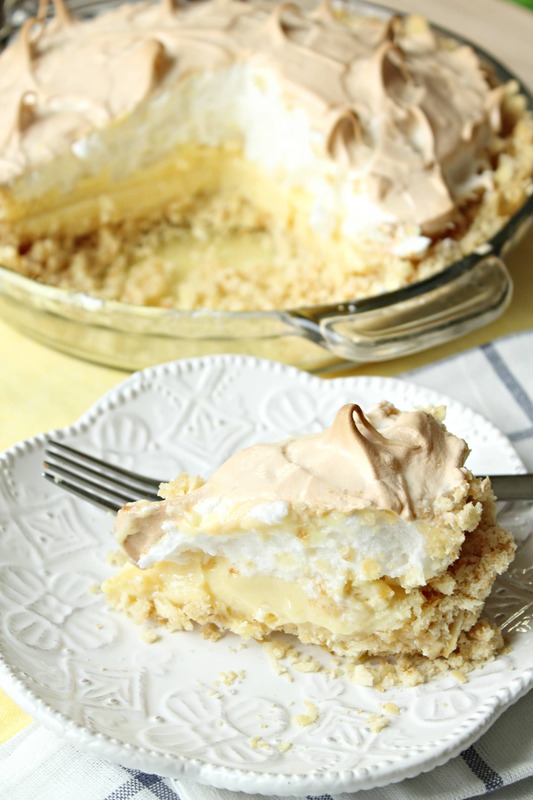 A sweet and salty pie that is reminiscent of lemon meringue. Crush the crackers in a plastic bag using a rolling pin or a heavy pot. Place into a large mixing bowl and add the sugar, then knead in the butter until the crumbs hold together like dough. Press into an 9-inch pie pan. Chill for 15 minutes. Bake the crust for 18 minutes and then set on a rack while you make the filling. Keep the oven on. Do not make the filling until the crust is done. It will begin to set while it sits. To make the filling, combine egg yolks, sweetened condensed milk and lemon juice. Mix until smooth with electric mixer on medium speed or a large whisk. Spread filling into crust; the crust does not have to be cooled. Now we make the meringue. Beat egg whites with cream of tartar and salt on medium-high speed with an electric mixer for 1-2 minutes, or until soft peaks form when beaters are raised. Gradually beat in sugar, 1/2 tablespoon at a time, until stiff glossy peaks form, and sugar is dissolved. Spoon meringue onto filling and spread to edge of crust to seal well and prevent meringue from shrinking. 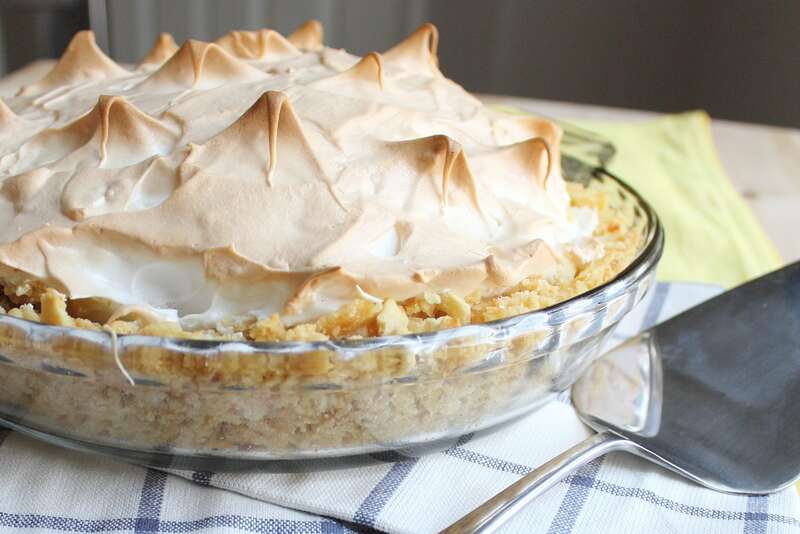 Bake pie for 15-17 minutes or until meringue has set. Cool for 30 minutes at room temperature, then refrigerate for 4-6 hours or until pie is completely cold. Thank you! Sweet & salty is such a winning combo, isn’t it?? This looks so good! 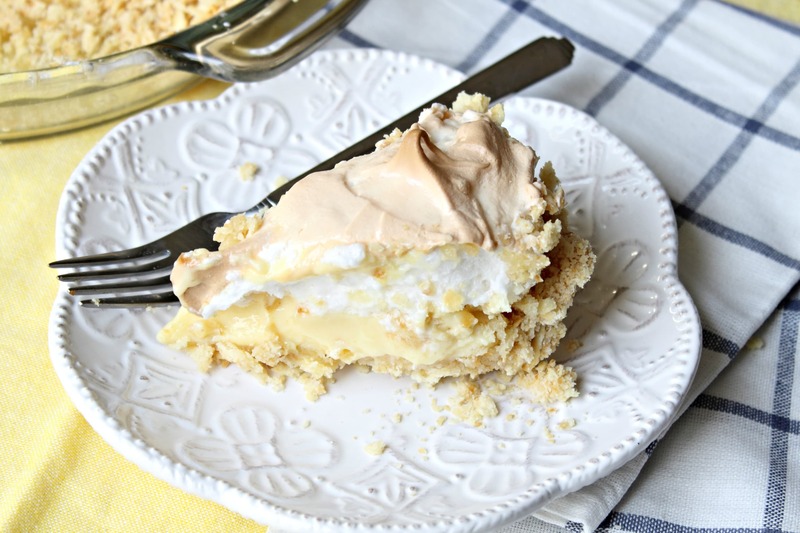 I love lemon meringue pie so I will have to give it a try. Thanks for sharing!